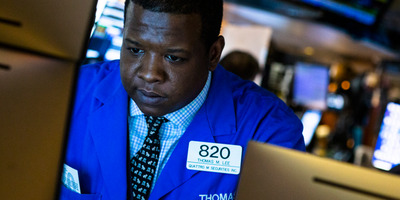 Eduardo Munoz Alvarez/Getty ImagesTraders work on the floor of the New York Stock Exchange (NYSE). “Buy low, sell high” is a common mantra in stock markets. But it’s actually a “fallacy”, argues UBS’ Justin Waring. It’s much better to just buy stock and hold it for the long-term, he argues. Waring, Investment Strategist Americas in the Chief Investment Office of UBS’ Wealth Management division, called the phrase a “fallacy” in a note sent to clients this week. Not enough people analyse the phrase, which really only applies to traders and doesn’t offer much help to long-term investors. For example, imagine an investor buys a dip in the S&P 500 and then sells once it hits a new record high. Under the ‘buy low, sell high’ mantra, that investor would generally have to wait for a 5% or 10% dip in the market to buy back in. But, more often than not, the market goes on to post new record highs after setting one record. “These market-timing approaches’ 2.5% p.a. returns are so dismal – and lag “buy-and-hold” so badly – that we had to switch to a logarithmic scale to even see them on the chart,” Waring writes.